The Wasps trio of James Haskell, Tom Palmer and Riki Flutey have taken the money on offer from French teams and I say good luck to them. The England internationals won't be the last because the money on offer from the French teams is twice, sometimes three times more, than players will be offered in the Guinness Premiership in England, where there is a salary cap in operation. A sporting career is a short one and you have to weigh up winning trophies, and cashing in and having a quality of life. Those English teams who fear losing home-grown talent will just have to face up to facts and understand that the free market is about supply and demand, and anyone can go anywhere to ply their trade. I sympathise with the clubs, who worry about putting a player through an academy and then facing the prospect of losing the player, but they will have to sign the player to a long-term contract right from the start. I accept the risks are clear when you do that. Will he be the player you expect him to be or not? That is the dilemma when it comes to contract negotiations. All English-qualified players know the risks involved in playing abroad but if they are smart enough to negotiate a contract that allows them to be at all the England training camps and to go on the tours then they have the best of both worlds. If a player is good enough it doesn't matter where in the world he plays his rugby. He should be selected on form and if the contract allows him to be released everything should be fine for England. 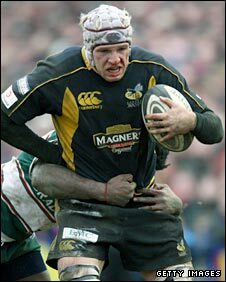 I think playing abroad will be a great experience for those who choose to do so and I hope Martin Johnson and the Rugby Football Union don't make a snap decision and start to make it difficult for those players who leave the English Premiership.